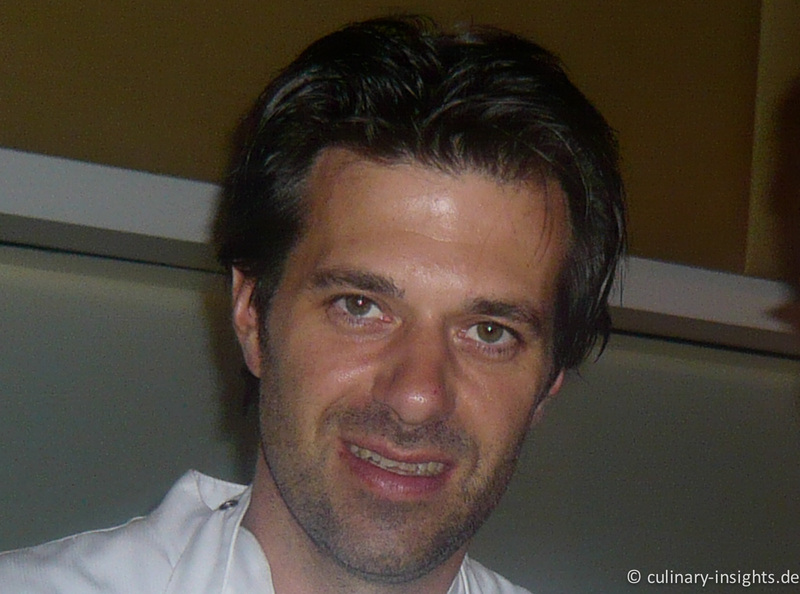 In August 2009 after a splendid diner at Oud Sluis I asked Sergio Herman what he still strives to achieve after being awarded three stars (since 2005) and 19.5 points in the Gault Millau. He paused and stated that first of all he wants to give the best every day (and for his highly artificial cuisine that’s a lot of work given the incredible booking situation and opening times serving lunch and diner during the week). And, then he added that he is eager to continuously reinvent himself. At the Flemish Primitives 2010, he stated more precisely that he wants to spread the “Sergio feeling” creating an overall dining experience working together with various artists (e.g. tattoos, porcelain, photo) to express his personal style. In the summer break of 2009 this development had just begun as he had completely renovated the interior of the restaurant into a very modern black and white “salle de noir”, combining the previously separated rooms and painting even the homey wooden ceiling white. When we dined there, the white brigade still needed time to feel comfortable and the whole setting seemed to lack the warmth and authenticity of previous years. Already in this very 2009 diner, the style of the cuisine had slightly changed as the style-defining presence of international, especially Asian flavors was less apparent and some dishes showed more looks than substance. The iFoie (top left) is a brilliant idea but it’s just apple and foie mousse with a sherry jelly which tasted good but did not create the most interesting interplay of flavors and textures that is one of the cornerstones of Sergio’s cuisine (thank god I added the brilliant textures of foie gras as a second foie serving (top right)). 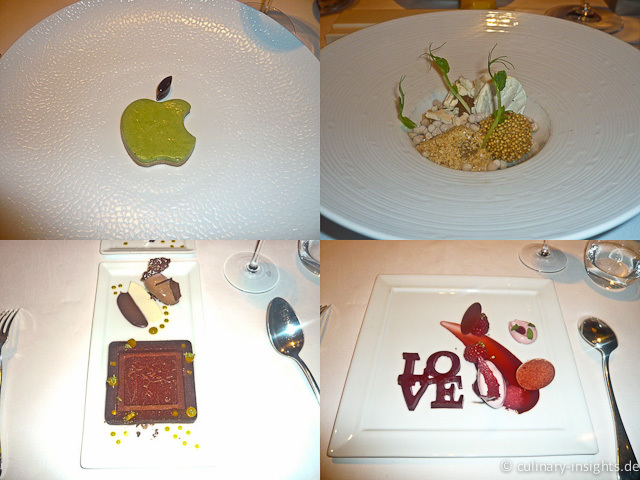 Similarily disappointing in this respect were both the tattoo dessert (bottom right – Sergio had created two tattoos with the legendary tattoo artist Henk Schiffmacher, one for the lady, one for the gentleman) and the LOVE dessert inspired by Robert Indiana. 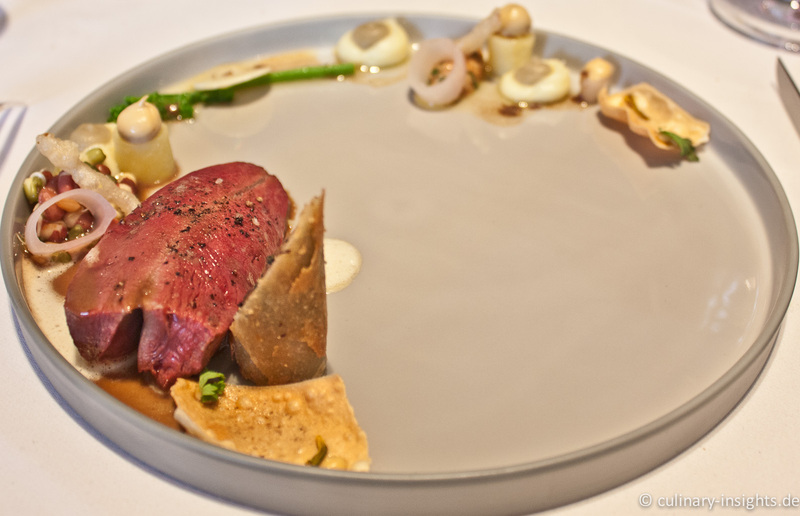 To be sure, most of the other courses were outstanding to divine, but the overall level of the meal was below my previous Oud Sluis experiences which showed more overall consistency. 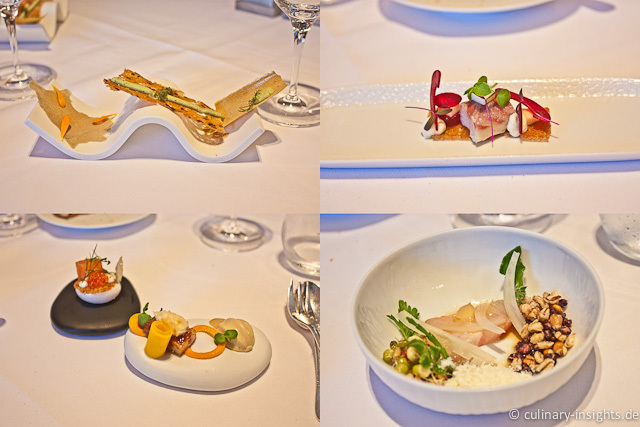 We opted for the six course (three desserts are counted as one course) Père et fils menu and asked for an additional course – in the end, they charged €185 for the enlarged menu. This is exactly the price for the now offered seven course menu. 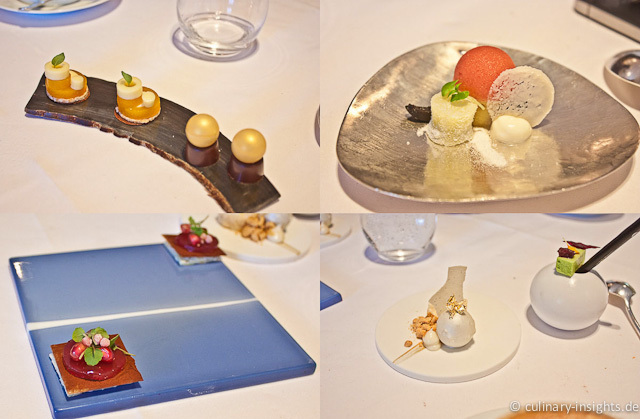 This parade did already show the direction of Sergio’s further development: an utmost precision even in the tiniest detail let the amuse (and later the petit fours as well) look like art in itself, like little sculptures. Although this sculptural touch had been present in Sergio’s dishes before, it was definitely some notches up for the amuse/petit fours. And, they did taste: mussels / almonds / oyster chips were perfectly fresh and crisp and the macaron with salmon and yoghurt was intense, yet showing a bit too much meringue (but half the macaron would do for many many other macarons as it can become far too dominating). Wonderful structures of carrot with amazingly tender pork belly, crab and miso followed by eel with beet root, sour cream and hamachi with sprouts, horseradish and soy formed the first phalanx of incredible amuse which certainly showed that there is no better way to start a meal – well, only they could have been served a bit more chilled (but this is a surely a tribute to the full restaurant and the immense workload necessary to prepare them). The second part of the amuse was also impressive: a very genuine salad / tomato cracker and goat cheese ice cream demonstrated how refined even the simpliest ingredients can taste if treated with utmost care and respect. 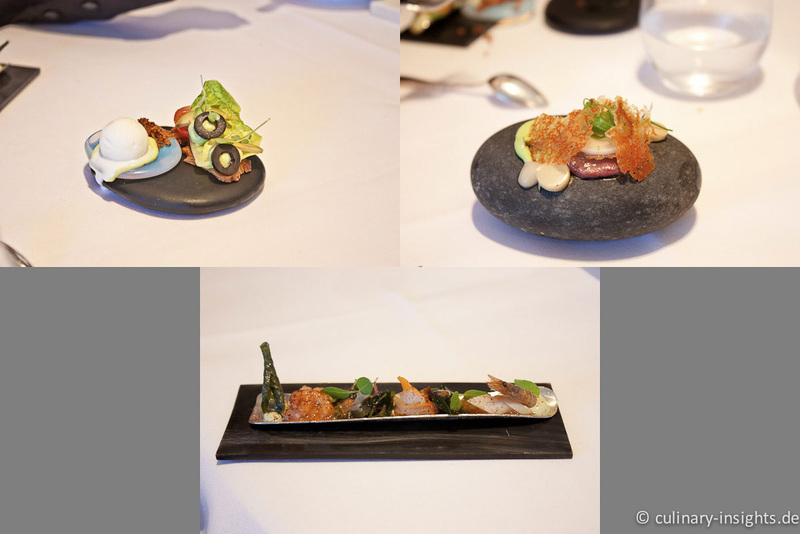 Last but not least, a delicate and very Sergio-like interpretation of thinly sliced Wagyu with spring onions, chicken skin cracker, avocado crème and Tomkagai jelly and a new version of the signature variation of local mussels: razor clams, small crabs, mussels with kaffir lime and dried soy jus. Outstanding and a big applause for this craftsmanship and parade of ideas. The first course took us back on the ground and we wondered whether this Stockman bowl of Greenland prawns was really served at Oud Sluis. Already from the appearance one can tell that this creation is less dense and complex than “usual”. Of course, the prawns were of outstanding quality and nicely marinated in soy and some lime vinegar, the accord with the fresh and intense cucumber and the slight temperature contrast with the granite of bergamot worked perfectly. Yet, I missed the textural accentuation that normally emphasizes exactly the right elements of the plate. Moreover, the many prawns seemed a bit repetitive although they were each individually aromatized by different wild herbs but this was more like Aduriz and less like Herman, somehow too subtle for him. For every other chef this would be excellent but Sergio can clearly do better. Next up was our inserted second preparation of langoustine: a carpaccio of langoustine filled with intense north sea crab meat surrounded by an archetypical langoustine jelly and a very intense lime/verbena-gel. Whereas the prawns had shown at least some texture, this was texturally too one-dimensional. And it was a bit rich – something I never experience before at Oud Sluis. 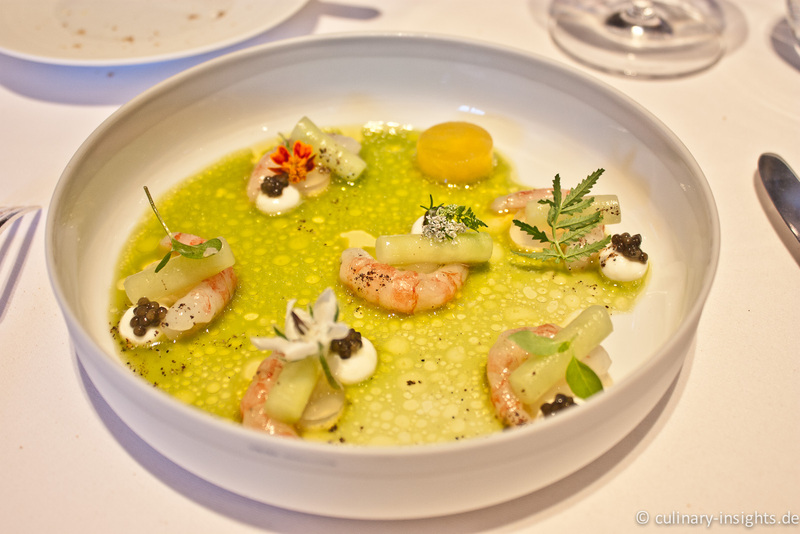 But, the taste was incredible, the carpaccio showed an amazing product character and the interplay of the langoustine, more rustic crab and the jelly and the herbal gel in combination with the shiso cress was a masterpiece. Sometimes, textures don’t seem necessary. Excellent. 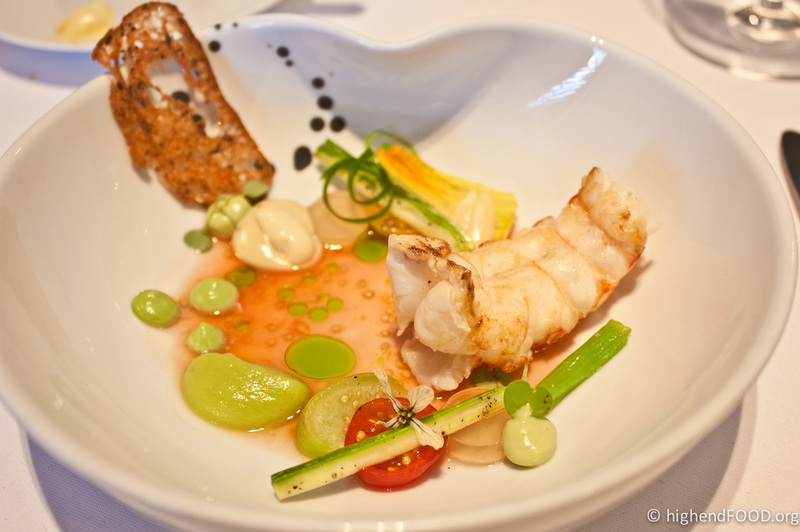 Ahh, finally, a typical Sergio dish: a benchmark species of roasted langoustine served with different tomatoes and courgette emulsion, spring onions and fresh almonds accompanied by a wonderful almond and tomato vinaigrette. As “simple” as it seems, this is Sergio at its best: perfect dimensioning with the almonds providing the essential unexpected kick, light, fresh (abandoning with heavy sauces but using light transparent vinaigrettes), product-focused and a nice textural overlay using the natural and pure courgettes, almonds and the thin toast. Pure pleasure – bravo! The next course was again most unusual as I never had a warm gooseliver dish at Oud Sluis before. A first dish to criticize also from a non-Sergio perspective: the hazelnut and goose liver emulsions made the dish overly creamy, the peach was a bit isolated and could not show its full potential such that the whole dish was not in equilibrium of sweet, sour, rich and earthy flavors. 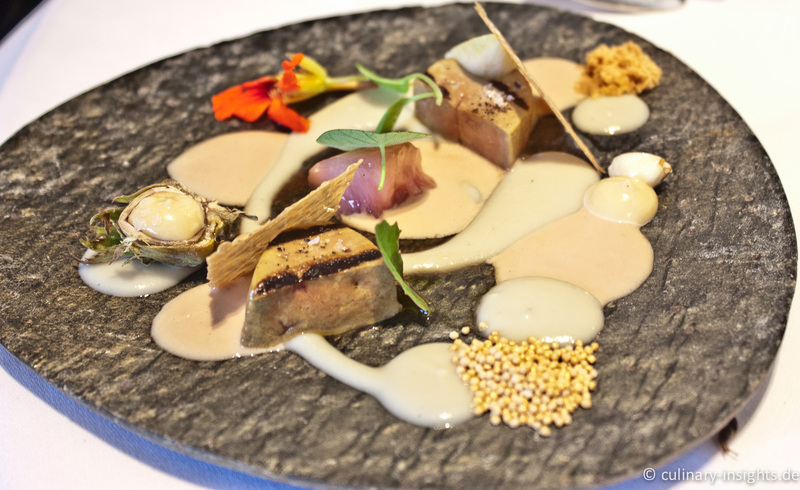 And, it’s hard to stand up against the quality of Anne-Sophie Pic’s roasted foie gras – nowhere in the world (except maybe for Troisgros) can this foie quality be found. So why serve this slightly inferior product? Overall, a very good dish and maybe one of the only dishes at Oud Sluis not at three star level. My dining companion got the eel with quinoa, a far more satisfactory endeavor as it again was pure Sergio and nice interpretation of the sweet-sour duality. Especially the marinated eel really added nice counterpart to the almost pure other elements as it grounded the dish. A textural balance act, perfectly constructed. Outstanding. A second divine dish: perfect loup (of the necessary thickness!) 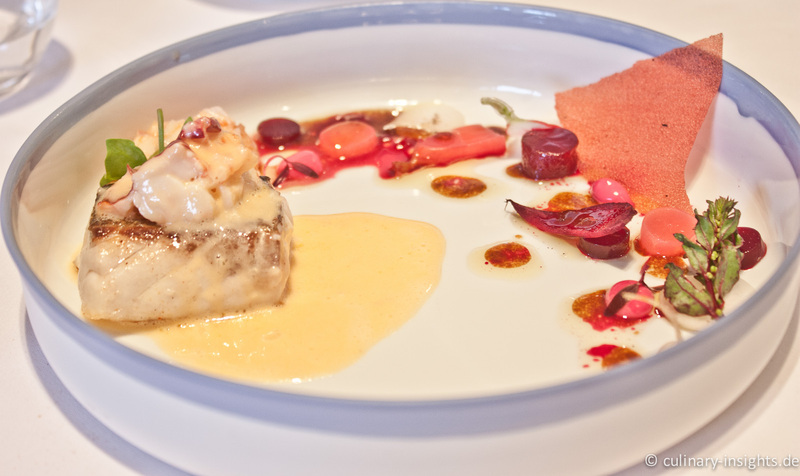 combined with surprising smoked lobster as indirect aromatization, some beet root and radish variations. Interestingly, one of the rare occasions where Sergio used a kind of beurre blanc that carried slightly smoky notes to add acidity, and balancing out the dish. Nothing else needed, nothing redundant… Amazing pairing with the Libanese Chardonnay! 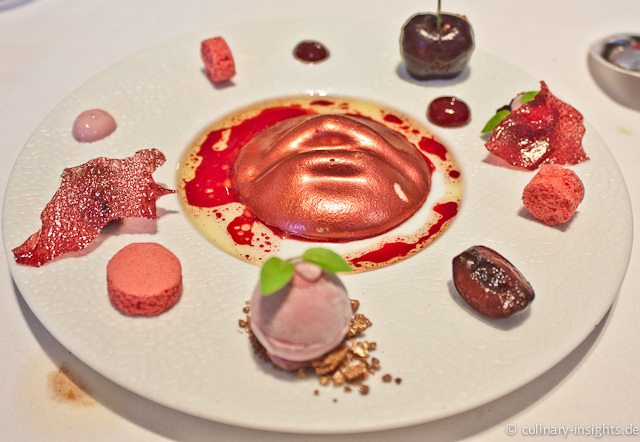 The first part of the desserts: contrary to last year’s only visually appealing dishes, this “mouth” delivered and showed the full spectrum of OS’s pastry mastery, artistically playing with the cherries theme with some mascarpone mousse and yoghut ice cream underneath. Not like an improvisation but like a cleverly arranged variation, never boring, texturally diverse and just to the point. Outstanding. 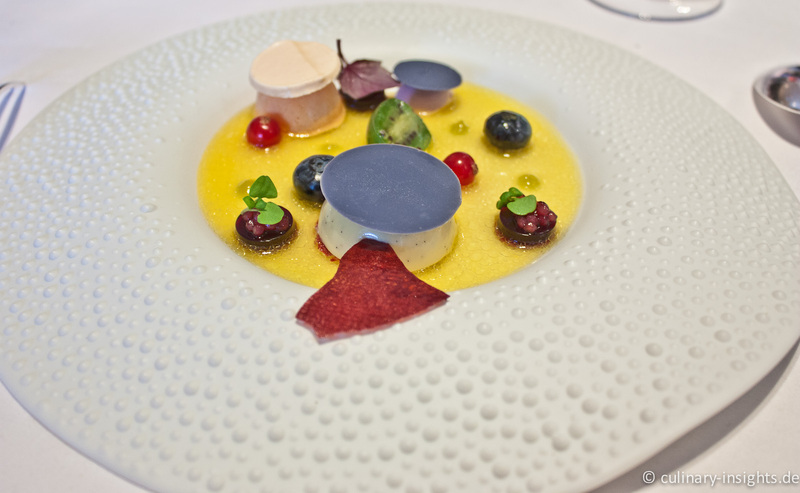 The third divine dish of this lunch: “berries in a leading role” showed how modern pastry can create new worlds to be discovered. A benchmark vanilla flan, different berries, various textural elements served with an incredibly sweet broth of berries and lime. Chapeau! 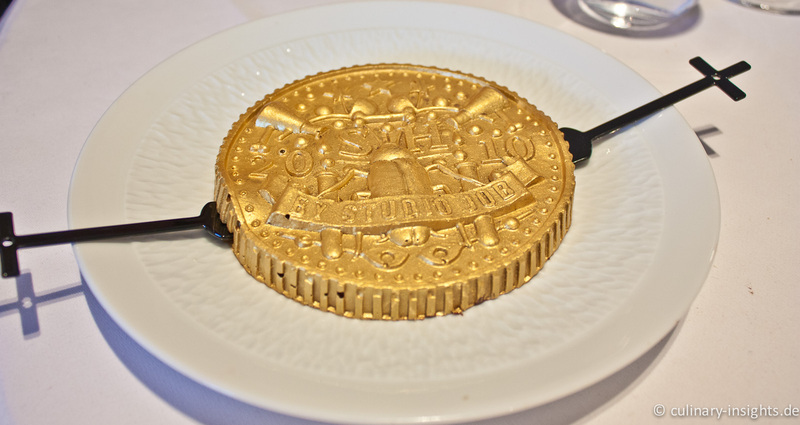 As I had not eaten the tattoo coins created by Sergio and the industrial designers of studio Job, he inserted them after the dessert parade. A bit reminiscent of last year’s visual phase, it is just chocolate, nothing else. Admittedly presented in an appealing way but not a proper dessert course as which it had been used end of last year. Simply too “boring” compared to the other desserts. The parade of petit fours repeated the artistry of the amuse – a delicate combination of verbena and aloe vera, passion fruit and white chocolate followed by a masterly miniature of a modern tiramisu with grenadine, milk crunch with yuzu and a fruit soup with mint. Overall, this lunch was much better than the 2009 experience, but not quite at the level of 2007 and 2008. The complexity of Sergio’s style is still very present and in way the he has taken the next step towards integrating visual dishes and filling them with more “content” and delicacy, especially the pastry is back on the block and has left its merely visual phase of 2009. Maybe the integration of both approaches will yield the “Sergio feeling” in the end. Interestingly, in my previous reviews I praised that Sergio exposes the diner to a new world of textural suspense and of unknown flavors/ flavor combinations. In this very respect, this lunch did not create that much sensation as in 2007/8. There are two reasons: on the one hand I have gained more exposure to fine dining and thus experience such that it is harder to really wow me. On the other hand, the competition did not sleep in the meantime – others have somehow tried to replicate Sergio’s structuralism (but most failed) or enlarged their spectrum of flavors and products. 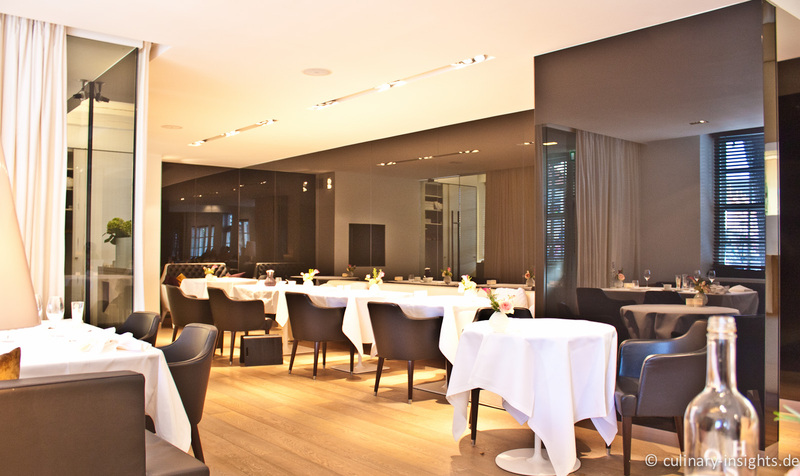 For example, whereas the gap between Sergio and the top German chefs was quite substantial in 2008 it subsequently narrowed down and chefs like Wissler, Bau, Elverfeld and Amador are at a similar level, yet with a distinct and different style. (On a side note, the whole modern Benelux “school” seems heavily influenced by Sergio’s (and also Jonnie Boer’s) work and thus seems repetitive from time to time. Only Peter Goossens has found his unique way in integrating both modern and traditional aspects and thus stands out (more to come soon on my Hof van Cleve visit)). 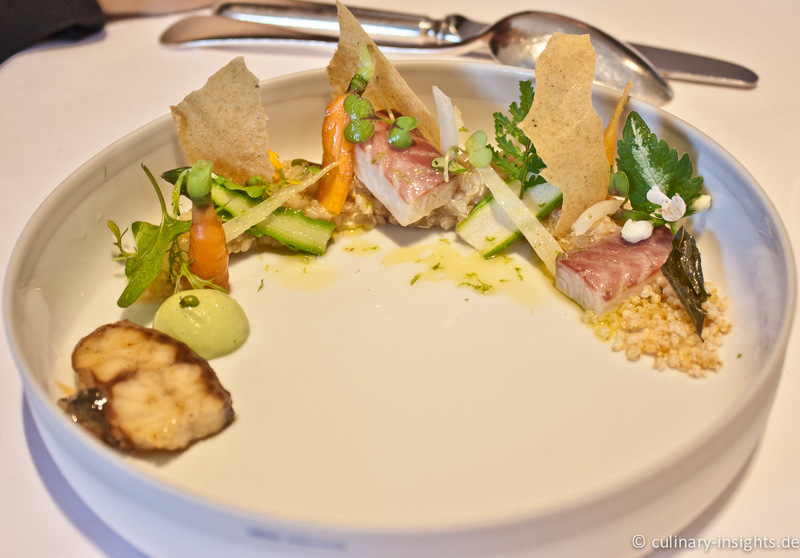 Another visit at Oud Sluis – even with the danger to bore you a little with my love for Oud Sluis, our menu this year was mind-blowing again and needs to be shared. The overall level was more consistent along the different courses. There are not many restaurants in the world were you encounter outstanding and perfect dishes that often. Oud Sluis is a treasure in Sluis located in the south-west of the Netherlands on the border to Belgium, six kilometers from Knokke(-Het Zoute, one should add) and about 15 kilometers from Brugge. Sergio Herman’s grandfather once ran a simple restaurant and his parents served informal fish dishes. Since 1990 Sergio is in the kitchen, first supporting his parents before taking over three years later.